It didn't take a year to finish because of the labor. 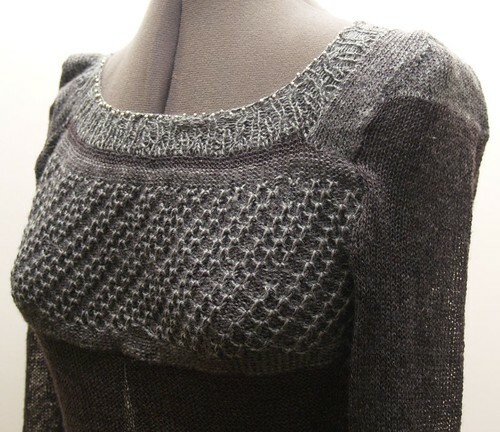 I had it largely done and put together the summer I learned to use knitting machines at RISD. But when I put it together, the seams were too large, and the task of taking it all apart with a seam ripper - without ripping into the very delicate knitting - was so daunting that I avoided it for a long time. Finally this year something inspired me to pick it back up again, and now, save for the under-layer I'd like to make to go with it, it's finally complete. This dress brings up a question that I find myself asking a lot. Why make something that you would never wear? It's not that I wouldn't like to wear this. It does fit me, and it is lovely. But on what occasion could I possibly take this out of the house? Would I wear it on the T, to the movies, to work? More importantly, what is the point of clothing that isn't immediately practical? Beyond merely the one fancy outfit that gathers dust in the back of the closet, where do such fanciful creations belong, and why are we compelled to create them? I say "we" because I'm hardly the only one. Just look at Christian Lacroix, John Galliano, or really the entire concept of couture. Hell, these days we even have people like Alexander McQueen, whose ready-to-wear collections beg the question "ready to wear where exactly?" Each outfit is more opulent and striking than the next, but what kind of activity are they good for? But I think maybe that's the point. These clothes speak to the characters we wish we were and the lifestyles we imagine possible, not to the gritty reality of today. There are plenty of ill-fitting jeans and sweatshop tees to remind me of not only the drudgery and lack of justice in the garment industry, but also of the daily commute, the leftovers I'll be eating for dinner, and the fact that I'll be eating them alone. To create this airy, gothic thing that speaks to a romantic, handmade vision is to drink a tall, cool glass of water on a hot, arid day. The parting message here is that maybe I wouldn't be comfortable in one of McQueen's or Galliano's creations while biking to work, but I can absorb that vision and meet them halfway. I can make the effort to put on mascara this morning, iron my shirt and make sure it coordinates with my pants, and pick some shoes that actually compliment my outfit instead of just covering my feet. Then I can remember to write to my congressman about pro-union legislation, and to choose to buy my next, beautiful thing from people who get paid a living wage to create it. Today won't be an action sequence out of my favorite anime, or a glamorous scene out of a Felini film, but maybe, if I keep creating beauty and justice, it can be a little less ugly than the day before. Jen - I saw this dress in the store - it is amazing! Not only do I love the dress, but I can totally relate to making items that are not readily wearable for the average consumer. It used to be a hobby of mine, before I got focused. Now, it is just fun sometimes to make that over the top piece. You know as you make it that it may never sell, but it was really fun to make! I'm totally grooving on your philosophical dilemmas here :) There is always that thought "where would I wear this" but there is also the fun of actually wearing it, and the prospect of that fun is what pushes me off the fence. Not everyone has the ability to acquire haute couture...but we all come in contact with amazing wearable art and when you accept the internal dare to wear it, it's pretty darn fun.